Specializing in all makes and models, the staff at Detroit Custom & Collision are always working hard to meet your automotive needs because it is our privilege to be of service. We believe in being here for each and every one of our customers. No matter what brings you to our shop, know that we are happy to be of assistance and ready to answer any question you may have regarding your collision repair. All insurance claims are welcome and we work directly with your adjuster to ensure that you receive the quality service and repair you deserve. 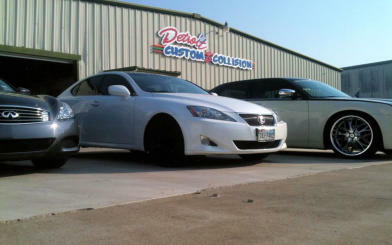 Detroit Custom & Collision is woman-owned and family operated by Chris and Carmen Rayner. 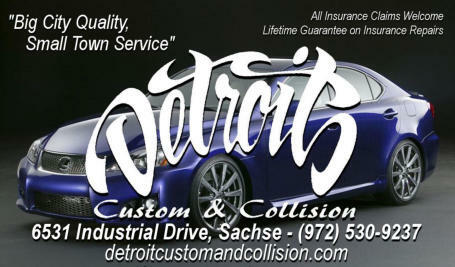 The shop is located in Sachse, TX between Garland and Wylie just off Hwy 78. Carmen, with the help of our friendly office staff, is committed to taking care of our customers through focused business management as she oversees the overall day-to-day shop operations. Chris, along with our outstanding body shop staff, has more than 30 years combined experience in collision repair, customization and restoration. It is our commitment to ensure that we provide each customer with the highest quality and most accurate repair service in the collision industry. 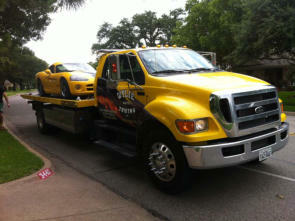 We are proud to work with Wylie Auto Towing Inc.
ready 24/7 to give you a lift and a helping hand. One call and help is on the way!! Enterprise Rent-A-Car is located just one short mile from the shop. Rest assured, should the need arise, we will gladly get you there to pick up your replacement vehicle.